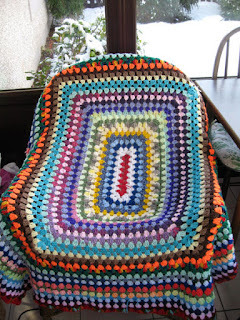 Journal Jottings : Hassles & More Snow, plus a Colourful Blanket and Blood Bikes. 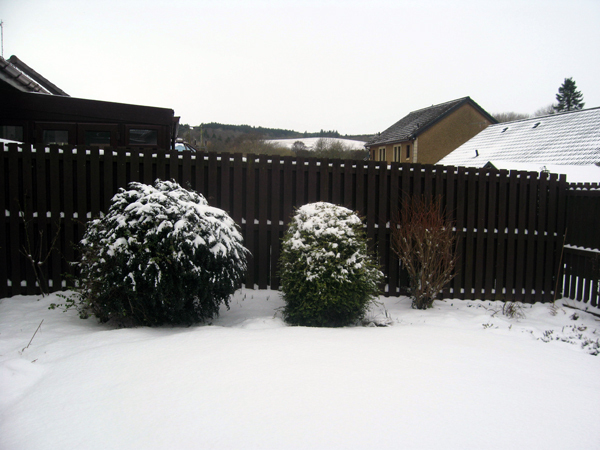 Hassles & More Snow, plus a Colourful Blanket and Blood Bikes. A week noted for hassles of one kind and another, with mixed up appointments, confusion over dates, major computer problems (yet again!) and a brief power cut. I finished my winter project - a crochet blanket for KAS - the Knit a Square charity (www.knit-a-square.com) - the brief - to make bright and colourful squares for blankets, beanie hats, handwarmers, soft toys and blankets for distribution to nurseries and crèches for young Aids orphans in Southern Africa. At the Auld Earlston meeting we viewed some fascinating old cine film of the 1930’s, transferred to disc, with views of the horse and hounds gathering in the Square, children excitedly leaving school,and taking part in school sports, horse drawn vehicles, harvesting and a society wedding with a military guard of honour, the women in fox furs and the men in top hats. It will make a great new item for our next show in October. The W.I. (Women's Institute) Meeting welcomed two Blood Bikers, with their motor bike parked outside, They were volunteers who provide an emergency, usually after-hours, courier service, transporting medical items such as bi-opsies, platelets, drugs and notes between hospitals,mainly between the Borders and Edinburgh. A fascinating taalk and another example of volunteer efforts and community spirit, . The computer had been giving us problems, taking ages to log on and log off and seemingly endless sessions of "configuring" - and we were warned it might need to be taken away to be sorted. Family History Fun - in the series "52 Ancestors in 52 Days, the theme was "Luck", so I wrote about an unknown third cousin making contact with me and giving a wonderful boost to my blogging activities with a wealth of stories, photos and extended family connections. A charming advertising blotter of my mother's second cousin Elsie Oldham, who ran a hairdressing busines from her home, using the more refined name of Elise, promising "Bobbing, Shingling and Marcel Waves". Auld Earlston - given =i it is three years this month since the blog was launched, a look back at some popular posts. 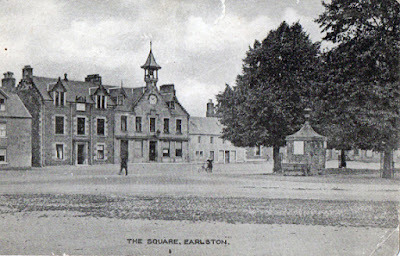 Earlston Square c.1900 with the Reading Room and the Corn Exchange. Journal Jottings on the previous two weeks’ activities - the highlight the theatre visit to Edinburgh to see "Carmen" with a difference. And Finally Amazing what you get done when the computer isn’t there. I had a major session updating the organisation of our household papers and files - ditto my family history material and sorted out my wool basket. I even did some polishing - something that tends only to,get done ahead of visitors! 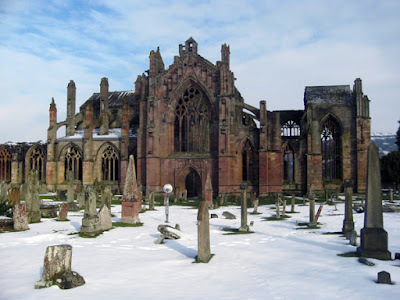 On a sad note, I attended the funeral of a neighbour, held at the Borders Crematorium, nestling under the Eildon Hills - a beautiful, peaceful setting, and so much better for grieving families who until a few years ago had to make the stressful journey to Edinburgh..